Scroll down to view graphic's indexes. Each week a new graphic, preset, or tutorial will be emailed to you, because it's fun! Only sign up if you like surprises! AmeriYank's Preset Shapes for Paint Shop Pro 7 Index"
Most items posted on this site are free. Donations of $1.00 are accepted to help with bandwidth costs. Click here to find out more. Sweet Pea's Paint Shop Pro Clip Art CDs -- choose from a wide variety of clip art CDs, from Jungle Safari to Mermaids to Plushies & more. The Plug-in Site -- great place to find wonderful resources for Paint Shop Pro and other graphics programs. Look on the left for the link to "Dingbat" fonts. Click on it. At the next page, click on the "A" link. At the page that follows, scroll down till you see the "Animals" font by Alan Carr. Download and place in your font folder. 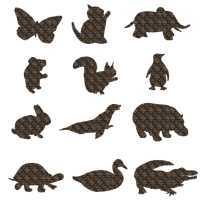 Download the animals preset shapes for PSP 7. The elephant below is an example of one of the images in the preset shapes file. The animals below show all the animals in the preset shapes file. Visit more graphics sites and vote for me! A link back to my sight is appreciated, but not mandatory. You may use the buttons below if you wish. Right-click on your choice to save it to your hardrive and then upload to your own server. Clicking on the angel below, when you see it throughout the site, will always send you to the main index page. The works on these pages are for the personal use of the downloader on their personal web pages and may not be uploaded to any electronic system or BBS for redistribution nor included in any compact disk (CD-ROM) or collection of any type without my written permission. To do so places the downloader /user at risk of severe fines and penalties for copyright infringement. Graphics from AmeriYank's Graphics Farm are CareWare. A link back to my sight is appreciated, but not mandatory. You may use the buttons below if you wish. Right-click on your choice to save it to your hardrive and then upload to your own server. This site, including all graphics and tubes are � 1999-2001 AmeriYank. All rights reserved.